We all wosh to look our very best on every occacssion which takes place. 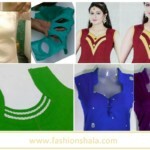 Blouse sleeves play an important part in beautifying the blouse. It enhances the overall beauty of the attire. 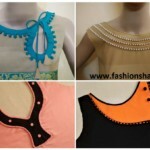 The designs on the sleeves provide with another dimension to the blouse. 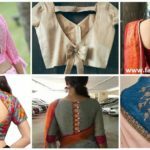 As the pallu covers the most part of the blouse, sleeves are all time visible thus they give the blouse a definitive look. Let us check out some beautiful sleeve designs. 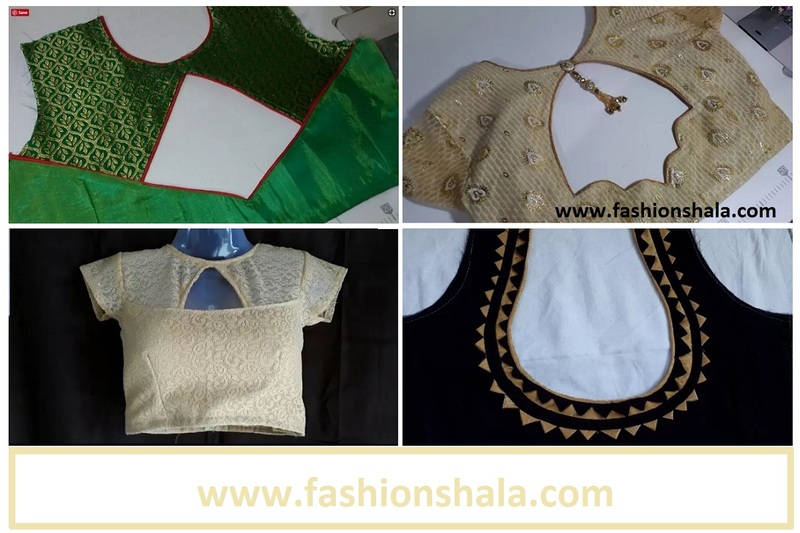 These sleeve designs are surely going to make you rock every occassion effortlessly. This is a very beautiful blouse sleeves design. It is a very beautiful combination of yellow and pink. The hot pink base is helped by the black linear design on the circular region of the sleeves. 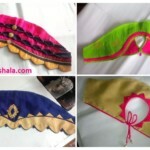 The hot pink cloth is otherwise plain and is beautified with the black strip design only. 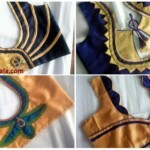 The base of the sleeves is made in yellow semicircular design. It is followed by a lace design. The hot pink base is beautified with the black folded strips. The strips are topped up with three buttons; one in the centre of each strip. Tgis short lengtyed sleeve design looks very beautiful. You can teem it up with a golden yellow or hot pink plain printed saree. Minimalist jewellery and makeup will be a good choice to be teemed up with this beautiful designer piece. It is a great choice for parties and functions. This is a very beautiful designer piece. The parrot green and hot pink combination is a killer combination. The parrot green cloth has beautiful golden patterns imprinted on it. 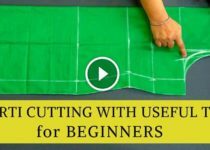 The short length sleeve starts with a parrot green piping at the edges. 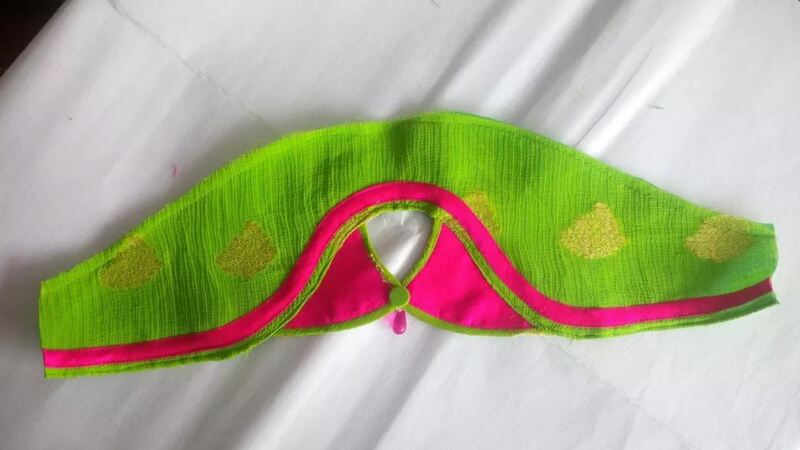 The green piping is followed by a hot pink strip. The sleeve strip is made into a trench at the centre. The centre portion has window type doors made in hot pink. The doors are sealed with a button and tear drop. The design is topped off with a cutout in the sleeve. This seems like a younger cousin to cold shoulders. Tgis hot pink piece is a stunner. It can bee teemed up with flower accessories for spring season. You can add pendant neck piece to this look. You can wear it to birthday parties or other functions. This is a very beautiful designer blouse sleeve design. The brown tinted yellow with hot pink looks very beautiful. This short sleeve design has hot pink piping at the edges. The piping gives rise to a circular cutout in the centre of the sleeve design. 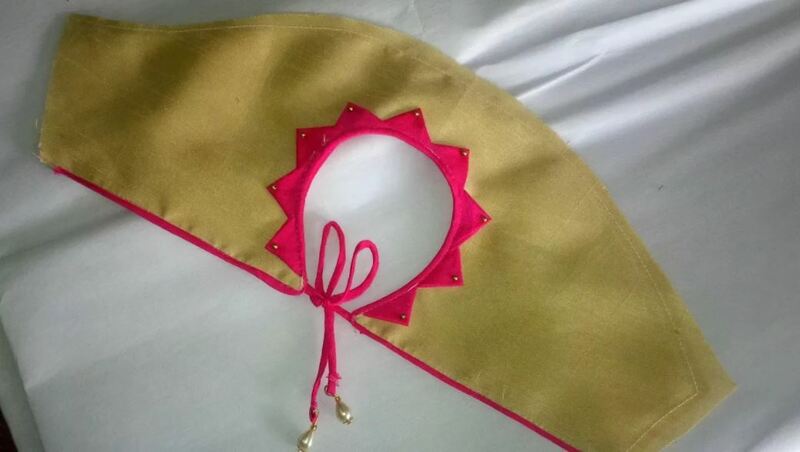 The circular cut out design has triangular pink design all around it. The circular design is tied at the bottom of the cutout with doris. The doris end in trinkets. You can even add latkan to add more beauty to it. You can beautifully teem ut up with fresh dewy makeup and a bright lip colour. Do not forget to add wings to your eyeliner while you go out in this ensemble. Add minimalist jewellery notion to this look. You should prefer wearing statement earings with this look. 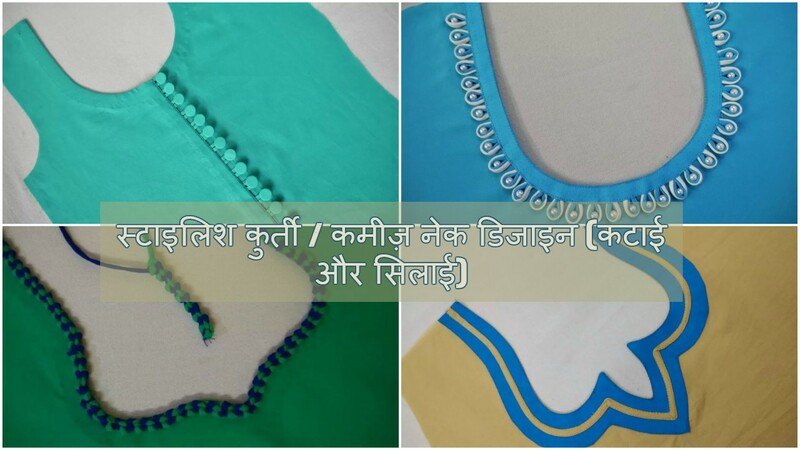 This designer sleeve design is a great chouce for weddings, ladies sangeet, engagement parties or even propmotion parties. 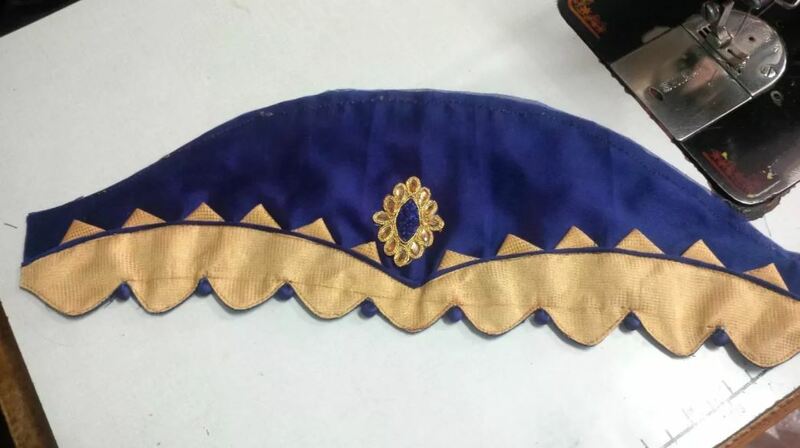 This is a beautiful gold with navy blue combination. This winged sleeve design is a true stunner. 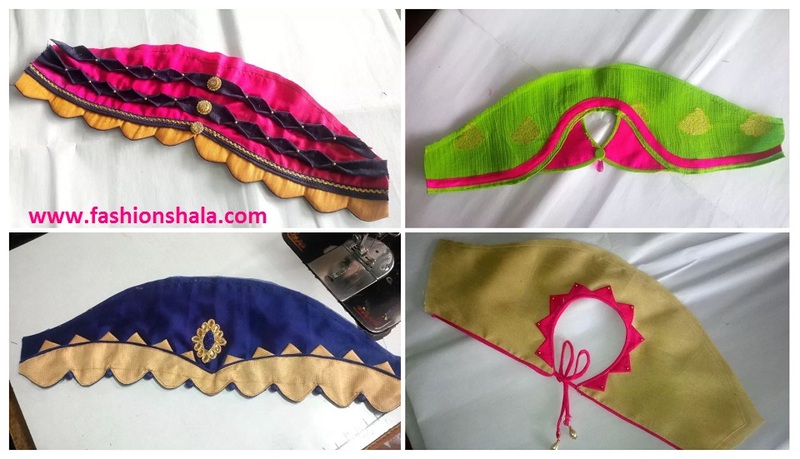 The base of the sleeve starts with a curvy edge and it has smal semicircular designs in golden colour. The top of this design has golden triangular design. 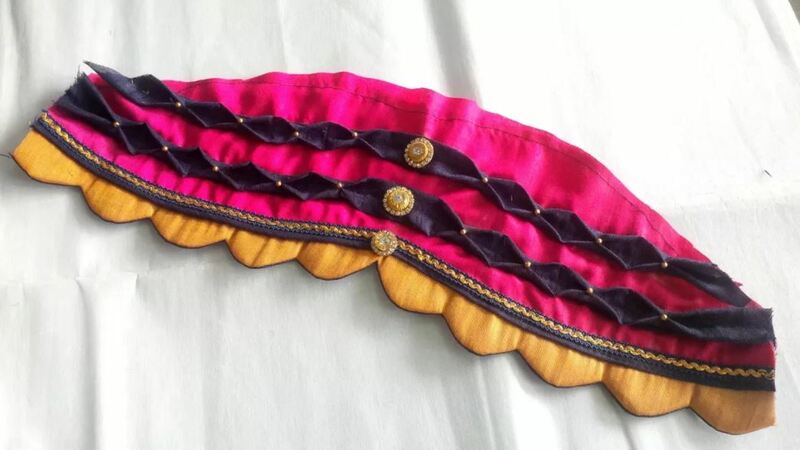 The centre of the sleeve design supports a pear shaped golden embroidery. This pear shaped design has beautiful floral embroidery all around it. This is a great designer piece. Teem it up with heavy makeup look but keep the lip colour subtle. You can surely go for a bold eye makeup. Do not forget to add glitter to your look. 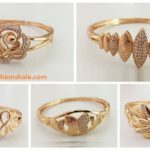 Add gold jewellery to your look to enhance its beauty. 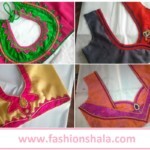 You can surely wear this ensemble to weddings, reception parties or even ladies sangeet functions. We hope you liked all these beautiful designer sleeve designs. These are the ultimate collection to effortlessly slay each and every occasion. We would like to receive your feedback. Do give your feedback in the comments section below. 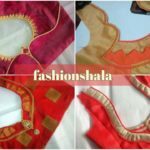 We will come up with more such content at Fashionshala.